Screened at this year's Sundance Film Festival were Wonders Are Many, Jon Else's film about the making of Dr. Atomic, the John Adams-Peter Sellars opera about J. Robert Oppenheimer and the creation and detonation of the first atomic bombs, and White Light/Black Rain, Steven Okazaki's heartbreaking and sobering series of interviews with survivors of those atomic attacks on Hiroshima and Nagasaki in August 1945. Seen in succession, these films could be engaged as a diptych on a horrific subject, with White Light/Black Rain a response to Wonders Are Many. After a succinct opening--a 90-second historical overview of events leading up to the dropping of the bombs--White Light/Black Rain makes a statement by asking a question: "What historical event occurred on August 6, 1945?" The filmmakers randomly pose this question to young people walking on the streets of Hiroshima. "I don't know," each teenager responds. "Did something important happen?" asks one. "An earthquake?" asks another. Okazaki had planned to ask 30 or more people this question, but stopped after the first ten. If this is what the younger generation knows about the most significant event in Japan's history, it's chilling to consider that 75 percent of Japan's population was born after 1945. Okazaki, the recipient of three Academy Award nominations, was born and raised in Venice, California. As an American of Japanese lineage, he was in a unique position to make a film on this topic. Did he feel a primary sense of loyalty to either culture? "I've always felt a certain distance from both cultures," Okazaki says. "I'm an American, but my grandparents, parents and I were treated as lesser because of the way we look. My grandparents lost everything [during the war]. My parents were squashed and oppressed. And I have had to fight twice as hard for my opportunities. But I'm not Japanese. If I don't open my mouth when I'm in Japan, then I fit in. But as soon as I do, then I'm a foreigner, an outsider. I understand the culture, but I'm not part of it and don't want to be. So, yes, I think I am a good choice to make this film because, although I know both cultures extremely well, I am ‘the other' to both." Since the first time he visited Japan 25 years ago, Okazaki had wanted to make "a great film about Hiroshima and Nagasaki--an ambitious, comprehensive, powerful film." But at the time, he felt he lacked "the skill to pull it off." Later, he recalls, he "faced a wall of censorship from both Japan and the United States," then he couldn't find the funding. He put "The Big Film" on hold and made the documentary short The Mushroom Club in 2005, which was nominated for an Academy Award. That film, explains Okazaki, was "a little tribute, a bow and a thank you, to the people of Hiroshima to pay off the debt I felt to them for sharing their stories with me." During post-production, Sara Bernstein at HBO Documentary Films (White Light/Black Rain airs August 6 on HBO) called and asked him if he was interested in doing "a big, ambitious film" about Hiroshima and Nagasaki. Okazaki sees The Mushroom Club as a "kind of introduction" to White Light/Black Rain. The first film "takes the viewer by the hand, and slowly you see the city, meet the survivors and hear bits and pieces of the story. I wanted to say, ‘Come with me, don't be afraid, just watch and listen.'" White Light is his "big film. It moves forward, very determined, doesn't hold anything back, and tells the whole story. It says, ‘Pay attention, these people have something important, disturbing and amazing to say.'" The film is vividly impressionistic and deeply moving. 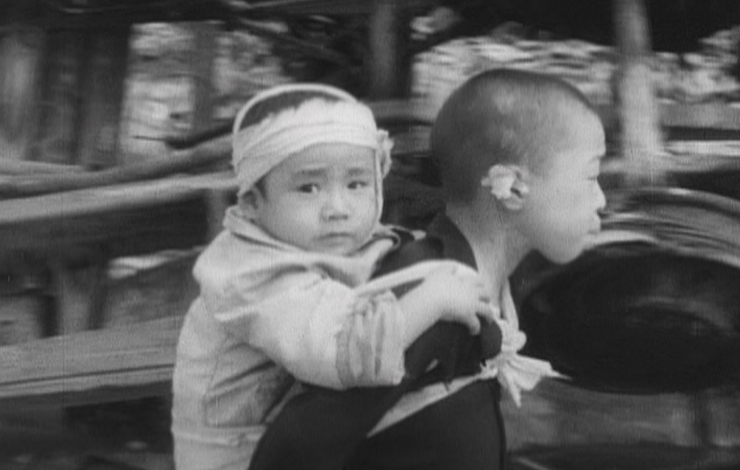 In addition to a series of captivating interviews with survivors and three American soldiers who carried out the bombing mission, White Light's rich texture, both visually and aurally, combines painfully disturbing archival footage, survivors' drawings of their memories of the horrific event, animation and an intriguing soundtrack that includes several tracks by the Scottish band Mogwai. To come up with the look of the film, Okazaki says he took his "cues from the subjects. They are warm, intelligent, shy people with great dignity. The visuals and the music serve their stories, and never overwhelm them, but also hold our attention when we need a break from the intense drama of the stories. "With most documentaries, you take advantage of every drop of drama you find," he notes, but the Hiroshima and Nagasaki stories are "so emotionally overwhelming--a child walking out of a bomb shelter to discover that everyone in her school is dead; a mother watching helplessly as her children burn to death; young children committing suicide--you have to be careful about devastating the audience and losing them." About the soundtrack, Okazaki explains, "One of the fun things for me on any film is thinking about the music. The moment the project starts, I listen to everything I can. I usually have a fat budget item called ‘Music Research' and I buy hundreds of CDs, listen to them, and think about the film." He says he "can't start editing until I have a strong sense of where I want to go with the music." He decided to forego period music because it made the film feel "campy and dated. Even though the stories are 60 years old, you want it to feel like it's happening now." A genuine sense of intimacy with the film's participants as they recount their stories is one of the remarkable aspects of White Light. Was it difficult persuading the survivors to open up about such a painful part of their lives? On the contrary, Okazaki maintains, "They were mostly incredibly eager to share their stories and tell the world what happened. Many said that their own spouses, children and friends were reluctant to ask them about their experience, so they appreciated the chance to really talk." By nature, a project such as White Light raises emotional, moral, political and philosophical issues and questions for a filmmaker. How did Okazaki handle them? "I try to not come to a project with a set moral or political stand," he explains. "I could be wrong and miss something because I was looking for something else. I try to stay open-minded, do the research, do the filming and edit the film. That's my job: to make the film, tell the story, not to decide the rights and wrongs, who's good and bad. He admits that White Light/Black Rain was difficult, emotionally. "I would be sitting there, listening to someone talk about reaching out to touch their mother and watching the body crumble into ashes. Later, I would worry that I wasn't reacting emotionally to what I was hearing, but would instead be thinking, ‘Wow, this will be a powerful scene.' But when I started editing the interviews and going through the archival footage, I would break down and start weeping, unexpectedly, every couple of weeks--not necessarily reacting to a particular scene, but the whole experience." White Light clearly goes to great lengths to be "fair"; there is little directive from the film to "take sides," to "blame" either Japan or the US (and yet, it holds both responsible for the consequences of their acts). Still, scathing revelations are made about both countries. White Light/Black Rain ends with the staggering statement that there are now enough nuclear weapons in the world to equal 400,000 Hiroshimas. As one of the military men responsible for dropping the atom bombs puts it in the film, "The genie is out of the bottle and can't be stuffed back in. From now on, the world will live with the possibility of nuclear exchanges and nuclear war." But Okazaki has more humanistic intentions for his film: "I just want people to stop arguing about the rights and wrongs of the atomic bombings, whose fault it is, who deserved it or didn't, whether it was worse, or not as bad, as other holocausts, and just listen to the stories of the people who were there. People like you and me, our parents, our children, our friends." Cathleen Rountree is a film journalist and author of nine books, including The Movie Lovers' Club. She writes extensively about films, film festivals and filmmakers for various venues, including Documentary magazine, Release Print and Greencine. Her blog on Women in World Cinema is at www.womeninworldcinema.org.